She had voluminous cumulus hair, a small, ruddy, grey floating fleck of a nose. The contours of her aquiline face were etched in the darker curves of the cloud. There was a pink edge to her cloudy, swaying form that was slightly painful to look at. She was fading, her essence bleeding away into the sky, slipping from material reality, dissolving into another state. And then she was gone. Just clouds. Bain, David (2013-11-16). 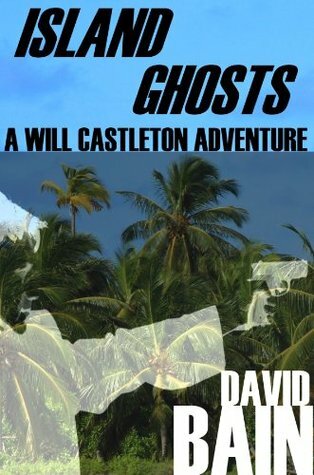 Island Ghosts: A Will Castleton Adventure (Kindle Locations 170-174). . Kindle Edition. David Bain’s Island Ghosts (on Goodreads, on Amazon) is a short story of just 3000 words that is just part of a series of books. I’ve had it in my Kindle library for a while, and just happened to choose it to meet the “takes place on an island” criteria for a reading challenge I am doing. I’ll be honest I didn’t have high expectations for the story when I began reading. The main character is a ‘”slightly psychic” U.S. Marshal’, and the premise is that through his psychic powers he learns of a person in danger, is the only person who might be able to save them, and has a race against time to help them. Just like every other story of a psychic. And yes it is undeniably clichéd. But it is surprisingly well written, with some truly beautiful imagery as evidenced in the quote above. To the point that the cliché is almost excusable. Island Ghosts is a very quick and easy read. I haven’t read any of the other books in the series, but this does seem like a good taster. I was left wondering how the story continues, and would like to read more. If you’re looking for a quick read with beautiful imagery and slightly dark plot, then Island Ghosts may be the story for you. A short review for a short story. If you liked it let me know. I’m currently planning on posting a weekly book review here, and it would be great to know whether you are interested in reading them! Far too many cloud references in such a short quote. Is the whole story a string of metaphors?